Before my cochlear implant surgery I searched for online accounts by deafened people. I couldn’t find many by people like me, who’d grown up hearing then done deaf. When I decided to implant, I never expected such incredible results. So, I’m sharing a few emails I sent out to friends and family in the first few weeks after switch on. My background? I grew up hearing, then nearly lost all my hearing in both ears from my late teens onwards. I wore hearing aids for ten years and started using sign language interpreters and palantypists at work. My cochlear implant surgery was quick, an hour and half. I recovered swiftly, without much pain or side effects. A month later, on 20 August 2013, my Advanced Bionics Naida CI Q70 was ‘activated’. Immediately following the initial ‘switch on’ procedure, where the audiologist played a series of beeps, I was able to hear my voice, which rapidly sounded more like my voice as the seconds went by. It was as if my brain was decoding and descrambling some 1990s bleepy electronica and turning it into speech – vocoder style. When I speak R2D2 similtaneously mimics my words in bleep language. These bleeps will go away in time as my brain rehabilitates to the high frequencies that were missing for years. Speech will sound more natural in time. After my appointment I called my husband on my mobile. His voice was clear and I understood him (at first but not when he said “I love you” because I laughed before he said it and the sound fragmented from then on). He was away working so later we video skyped and I could follow everything he said without him signing and typing. The initial, intensive hearing rehab will take a few weeks, I go to hospital for weekly tweaks and rehab sessions. On skype Tom’s voice was crystal clear but with a metallic edge. . I’m exposing myself to lots of sounds, training my brain to interpret the electrical signals that are being sent to my auditory nerve via electrodes inserted into my right side cochlea. I was with friends yesterday and their voices sounded low in the mix – distant. Frustrating. This was because the CI mapping is not complete. I have to go back on Friday. Sound quality and speech comprehension will continue to get better and more natural. Traffic sounds like cars made of skidding bleeps, although yesterday after many motorbikes, one sounded farty instead of bleepy. More like a motorbike. This demonstrates the process of habituation. I can hear everyday domestic sounds well like water running and appliances bleeping. This morning I tried to hear a cat purring but he bit me. I listened to an audio book whilst reading – that was good and now I’m listening to the Radio 4 Today show, presented by people who’ve overdone the helium. The helium effect is another early days thing. I don’t know what is being said yet, but it’s miles better sound quality than before. It sounds nice! Maybe one day soon I will understand it. It’s an adventure. Getting implanted felt like a drastic option. But meeting an implanted person who had been deafened like myself, swung it in the end. He said he’d got his life back and had never looked back. He could speak to people on the phone and everything. After many tests, the surgeon and audiologists said unreservedly that an implant would help me a lot, more than hearing aids, and that I would do very well. It’s tempting to up the jeopardy I faced in undergoing surgery (they drilled into my skull etc). It’s tempting to raise the stakes to you, in order and replicate the magnitude of the ‘journey’ I and others go through with implantation. There are risks, I was scared, but when I looked at the whole thing rationally and took a lot of time to inform myself, and speak to other implantees, it seemed like a very good idea. I’d tried everything else and I still had lots of communication problems. 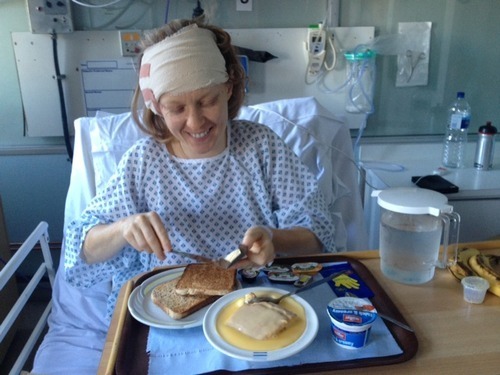 But it was still tough to suspend my disbelief and believe surgery would work for me, not after so many years of adapting and “managing my expectations” about my hearing, It was tough to dare hope I could reverse what I’d lost. Because to hope is to expose myself to having those hopes dashed, which I eventually decided I’d be fine with. FINE, dash my hopes, I said. I love that all dashing stuff. It’s like music to me. It would take several pages to explain the emotional back end, or why it was important, and such a block, when everyone is naturally more interested in the switch on results, but I just wanted to convey a little bit of what I was feeling in the last year, in order to give you an idea of how I am now feeling. I haven’t had time to start feeling it in fact. I still daren’t. Not until I can follow live speech in conversation. That’s what I’m after. Crossing my fingers for Friday’s mapping bringing more breakthroughs.